I feel silly calling this a recipe. So let’s call it a “recipe.” You’ll see why the quotes are necessary as you continue reading. This “recipe” was dreamt up after dinner last night when Vishnu asked, “Do we have any dessert?” And before automatically saying no, I scanned the kitchen and said, “Wait, I have an idea!” The next thing I knew, the oven was pre-heating, ingredients were being gathered, and aluminum foil was being folded to create makeshift boats. This dessert is perfectly sweet and creamy. The only thing that would’ve made it better is a scoop of ice cream. As they say, hindsight is 20/20. Pre-heat the oven to 350 degrees. Place the banana in the middle of the aluminum foil (one per sheet). 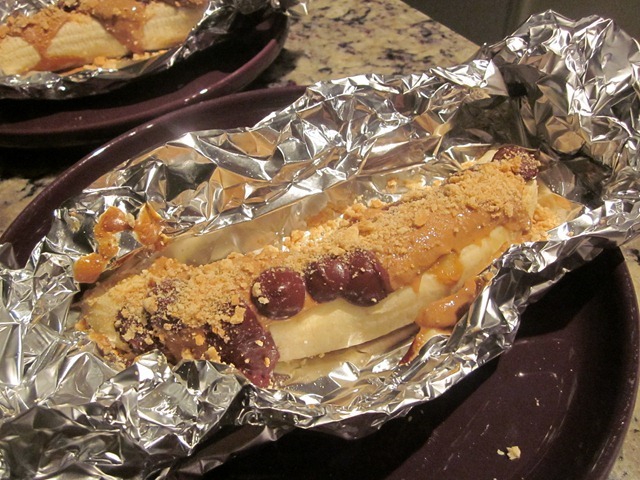 Crumple the sides of the foil until all four surround the banana and create a little boat. 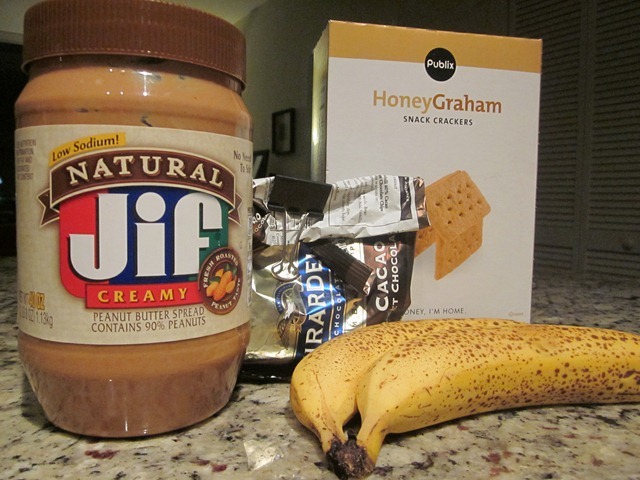 Top the bananas with peanut butter and chocolate chips. Place the boats directly on the middle rack of the oven. Bake 10-12 minutes. Carefully remove, top with crushed graham crackers and enjoy! Like I said, the only thing that would’ve taken this to the next level is a scoop of ice cream. There’s always next time! Oh and…HAPPY FRIDAY! Here’s to an uneventful weekend and sleep! that is one hell of a creative dessert and the best combination possible. happy weekend!! Ohhhh my goodness. I’m totally making this tonight!!! That looks amazing! BRILLIANT idea Parita! I could so see this happening at our home – so NOT a silly recipe! Shashi @ http://runninsrilankan.com recently posted…Lentil & Tofu Stew with Roots Hummus! I’ve never tried baking a banana but I hear it’s unreal!!! Mmm, so tasty! Reminds me of a “recipe” I learned as a Girl Guide (in Canada… in the US they are Girl Scouts!) 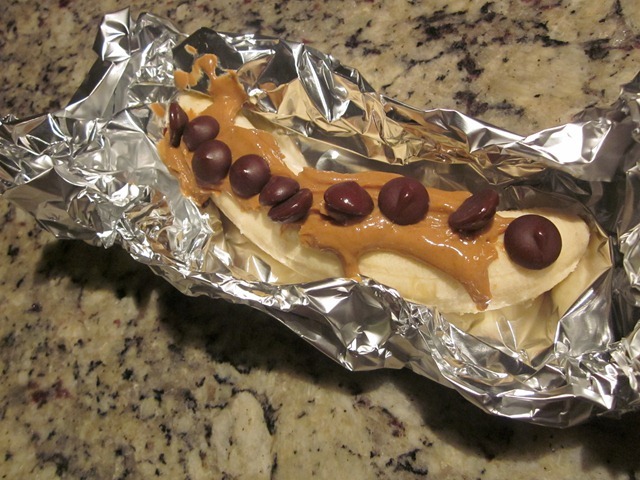 which involved the banana, chocolate chips, and mini marshmallows, wrapped in an aluminum “boat” and warmed by the campfire. Yum yum yum! Our simplest go-to dessert is cut up strawberries with bananas and a small dollop of whipped cream. Yummy and healthy too! What a creative dessert!! I would of never thought of something like that. I love banana anything! Can I replace the banana for a potato? Just kidding, but this looks like it could satisfy any craving of the sweet variety. I love those dirty deep fried bananas with cheap vanilla ice cream from hole in the wall Asian restaurants.